정현영, 전은례,(2011).중국유학생의 한식 메뉴 선호도 및 기숙사 급식만족도.한국식품영양과학회지,40(2),283-289. 본 연구는 중국유학생 한식메뉴 선호도와 급식의 만족도를 알아보기 위하여 목포대학교에 재학중인 중국유학생 총 167명을 대상으로 설문지를 이용하여 조사대상자의 일반적 특성, 한식재료 총 40종의 기호도, 중국학생들의 식습관, 한 국음식의 인지도와 선호도, 기숙사 급식실태, 급식서비스 속성에 대한 중요도와 만족도 등을 비교, 분석하였다. 조사대 상자는 ‘남자’가 90명(53.9%), 한국체류 기간은 ‘1학기 거주’가 97명(58.1%), 건강상태는 ‘건강함’이 80명(47.9%)임을 알수 있었다. 한국음식에 대한 인식도로는 ‘맛이 담백’이 3.36±0.95점, 한국음식 식품군별 기호도는 고기류에서 ‘쇠고기’가 78명(46.7%), 생선류는 ‘갈치’가 48명(28.7%), 야채류에서는 ‘배추’가 39명(24.4%), 과일류는 ‘귤’이 82명(49.1%), 우유 및 유제품은 ‘흰우유’가 65명(38.9%) 등이 가장 높았다. 식습관 중 편식여부는 큰 차이가 없었고, 식사하는 이유로는 ‘공복감 해소’가 72명(43.1%)으로 가장 높았다. 한끼 식사량으로는 ‘적당하게’가 98명(58.7%), 식사를 거르는 이유로는 ‘시간이 없어서’가 81명(48.5%), 식습관에 영향을 주는 요인으로는 ‘가족의 식습관’이 92명(55.1%), 식습관 중 가장 큰 문제라고 생각하고 있는 것으로는 ‘불규칙한 식사시간’이 67명 (40.1%)으로 가장 높았다. 한식 메뉴별 인지도에서는 배추김치, 불고기, 깍두기, 삼겹살, 떡볶이, 갈비탕, 곰탕 순, 선호도에서는 불고기, 돼지갈비찜, 소갈비찜, 닭갈비찜, 삼겹살, 갈비탕, 닭도리탕 순이었다. 인지도와 선호도간의 차이검증 결과는 비빔밥, 떡국, 된장찌개, 김치찌개, 떡볶이, 잡채, 배추김치, 깍두기(p＜0.001)에서 유의한 차이가 있었다. 또한 전복죽, 비빔국수, 소갈비찜, 돼지갈비찜, 닭갈비찜, 생선매운탕, 곰탕(p＜0.01), 호박죽, 불고기, 닭도리탕(p＜0.05)에서도 유의한 차이를 보였다. 기숙사 급식실태는 하루 중 식사 횟수로 ‘2회’가 79명(47.3%), 식사소요시간으로는 ‘10~20분미만’이 109명(65.3%), 급식을 이용하는 이유로는 ‘의무식 규정이어서’가 62명(37.1%), 급식을 이용하지 않는 이유로는 ‘맛이 없어서’ 76명(45.5%)이 가장 높았고, 식사 시 가장 많이 남기는 음식종류로는 ‘김치류’ 46명(27.5%)이 가장 높았다. 급식서비스 중요도에서는 ‘식기의 위생’이 4.22±0.77점, 만족도에서는 ‘식사 후 냅킨?거울?급수시설의 설비’에서 3.64±0.80점으로 가장 높게 나타났다. 중요도와 만족도의 차이검증 결과는 식당의 위치를 제외한 모든 항목에서 유의한 차이(p＜0.001)가 있었다. 이와 같이 중국유학생들의 급식 만족도를 높이기 위해서는 학생들의 요구에 맞는 맛과 다양성을 추구하고 이를 반영하여 음식 맛을 개선하고 음식 맛을 돋을 수 있는 형태나 외관에 대해서도 만족할 수 있는 조리법을 개발하는 단체급식이 되도록 노력해야 할 것으로 보인다. The preference and satisfaction for Korean food by Chinese students studying at Mokpo National University of Korea were surveyed. The students (n=167) were 53.9% males, 58.1% Korean residents for 6 months and 47.9% in healthy condition. The recognition of Korean food was highly light taste (3.36±0.95) and the preference of Korean food materials was in the order of beef (46.7%), hairtail fish (28.7%), baechu (24.4%), tangerine (49.1%), milk (38.9%) in each food category. Eating habits were feeling of hunger on reason for eating (43.1%), moderate satiety degree for a diet (58.7%), no time for reason to skip diet (48.5%), family for impact factor of eating habits (55.1%) and irregular diet time for the problem of eating habits (40.1%). The recognition of Korean food menu was in the order of baechukimchi, bulgogi, ggakdugi, samgyupsal, ddeokbokki, galbitang, and gomtang; the preference order was bulgogi, doejigalbijjim, soegalbijjim, dakgalbijjim, samgyupsal, galbitang, and dakdoritang. The recognition and preference of Korean food menu were significant in bibimbap, tteokguk, doenjang jjigae, kimchi jjigae, ddeokbokki, japchae, baechukimchi, and ggakdugi (p＜0.001), as well as jeonbokjuk, bibimguksu, soegalbijjim, doejigalbijjim, dakgalbijjim, saengseonmaeuntang, gomtamg (p＜0.01), hobakjuk, bulgogi, and dakdoritang (p＜0.05). The actual dormitory foodservice was twice daily (47.3%), ＜10~20 min for diet time (65.3%). 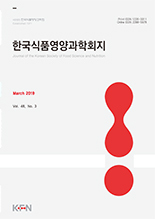 The reason for using university foodservice was compulsory diet (37.1%) whereas the reason of not using university foodservice was tastelessness (45.5%); kimchi was the most leftover (27.5%). According to foodservice quality attribute, the importance and satisfaction were the highest in hygienic part. Foodservice quality attribute was significant between importance and satisfaction in all items except location of facilities foodservice (p＜0.001).